The way you cleanse your face is actually the most important part of your regimen (It's the first step!). So if you're always getting weird bumps or pimples but haven't been trying any new, possibly irritating products, read below to see if you're guilty of any of these face-washing no-no's! You use your body soap on your face. Body soaps work well at cleaning your legs and pits, but they have an alkaline pH. They strip the skin of its natural oils and dry it out. And always remember that a dehydrated complexion = more clogged pores. If you're unsure about the right cleanser for you, check out our options here! You scrub your face too hard. We know you want to get rid of those blemishes, but roughly scrubbing your complexion with a grainy face scrub won't do your skin any good. You could end up causing further damage like micro-tears, wrinkles, dryness, and broken capillaries. 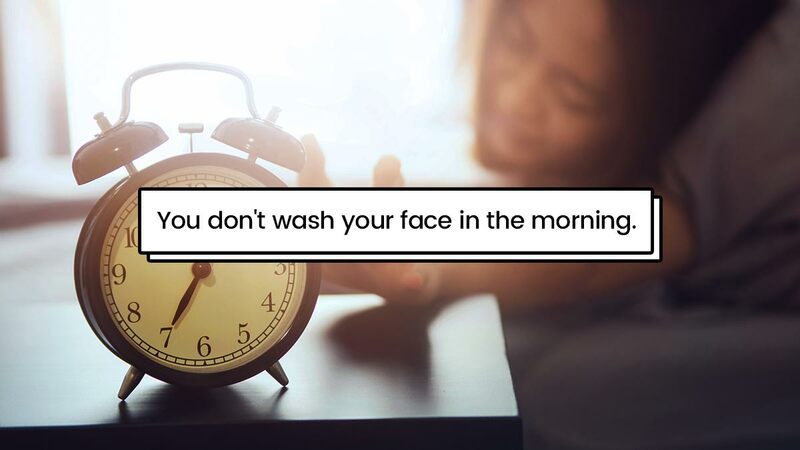 You don't wash your face in the morning. Sleeping allows your skin cells regenerate, but dirt, oil, and germs can still get trapped in your pores during those eight hours, thanks to your pillowcase. You use water that's too hot. Vogue Australia explained that using hot water to wash your face can burn your skin and dry it out. When in doubt, ~warm water~ is the best! You use your body towel on your face. You forget to cleanse before putting on a face mask. Most faces masks require that your skin is bare and clean to allow the ingredients to penetrate into your pores. So if you don't cleanse before, you're just wasting the product! You use your regular cleanser to remove makeup. Most makeup products today are waterproof, sweatproof, and smudge-proof, so a basic cleanser won't properly remove them, according to SELF. We recommend trying the double cleansing method to clear your pores of any makeup, oil, and bacteria.